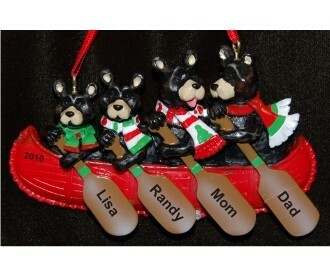 Ornament description: New the year, this family ornament features a canoe full of "bears", loaded down with the family Christmas tree and gifts. Personalize the family ornament for four with each person's name and the year. The personalized ornament measures 5.25"W, and includes our holiday ribbon for convenient hanging. To complete the presentation, the family Christmas ornament arrives nestled within our exclusive black velvet drawstring bag.